How do you earn respect? Do you give respect to others even when they don't deserve it? Do you respect your elders or supervisors only because of their status or position? Plain and simple, I'm having problems at work. The supervisor is a heavy micro-manager and it's driving me insane. Instead of trusting his employees to do the right thing, he insists on spying on them (through the computer or simply standing behind you for hours at a time). I know what needs to be done and complete it within the schedule and assure you that nobody needs to watch me work. Honestly, I believe he singles me out of the group because I've been the ONLY one to step up to him. He is on the border line of harassment at times and uses intimidation tactics to get what he wants. I don't respect him. He lost that "priveledge" a long time ago. Today I was told that I needed to respect him and I'm having major issues with that word. Shouldn't you earn respect (or give respect to others) in order to receive respect in return? 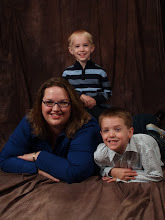 The kiddos are gone for the summer and I’m missing them tremendously. The house is not the same. I miss the constant hugs. I miss hearing them say “I love you”. I miss tucking them into bed. I miss picking them up from daycare and hearing about their day. I miss someone sitting in my lap for a cuddle. I miss playing games with them. I miss their knock knock jokes about apple sauce. I miss reading them their favorite books. I miss the little things they find so interesting. I can't ask for a better kid. 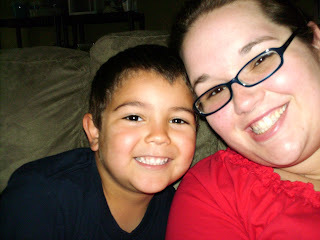 Devin is an awesome little boy and this was a rare moment that he actually wanted to take a picture with me. He is still leary of us being around (espeically me), but it's still going better than expected. Chase and I made it official this weekend. The kids and I have moved in, all my mail is forwarded to the house, and the address on all of my bills have been changed. The house is a mess and the garage looks like a tornado has blown through it but it is done. I'll be on and off line sporadically for the next couple of months. Hopefully, our internet will be set up soon. But for now, I'm going to have to get around the blocked security of the internet police at work. Yes, today I turn 26 years old. There is nothing really "happy" about this day other than I'm another year older. Motherhood is tough. If anyone says it’s easy; they’re lying! It’s a never ending cycle of breaking up fights, laundry, cooking, cleaning, whining, crying, wiping butts, kissing boo-boos, watching SpongeBob for the 50 millionth time, etc. If you are lucky, you receive the precious gift of just a moment of sanity. This morning was the gift I have been waiting for. The boys came home after Jimmy’s visitation weekend. In just a matter of days it seems as though they have grown inches. They were timid at first and not wanting to talk to me. That’s normal for both of them and I’m starting to get over it (it hurt a lot those first couple of months when they came home). All I wanted to do was have them in the same room with me. This morning on my way into work, I couldn’t keep my eyes off of them. I was the crazy lady who couldn’t drive on the freeway because she wasn’t paying attention. Sorry to all those drivers out there who cussed and threw the bird at me. Anyway, this morning I looked at those two boys and realized that they are my heart, my soul, my everything. Motherhood is tough, but it’s worth every single non-sanity minute. Devin’s daycare is doing a “school play” on Thursday this week. Over dinner Chase and his parents talked excitedly about going while I sat silently in the corner. That was the first I had heard of any school function; obviously I wasn’t invited to go. I want to be there for Devin, support him in any way I can, be able to take all the pictures I want, and clap along with everyone else. I don’t want to hear second hand of how well he did. Last night Devin was singing the songs that he was going to perform at the play. After he finished and I gave my round of applause he said “I want you to come and watch me. You have to bring your camera so you can take lots of pictures of me. That’s what all the other parents do.” What do I say to a 4 year old? “I can’t make it buddy. Maybe next time.” That would be a lie because I would be there in a heart beat. Do I tell him the truth? “Sorry, I wasn’t invited and your mom doesn’t want me there.” I decided against that. Instead I simply said “I’d like to go” and left it at that. I wonder how long it will be before I’m invited to his school functions. I wonder how long it will take to get over the feeling of being an outsider looking in.